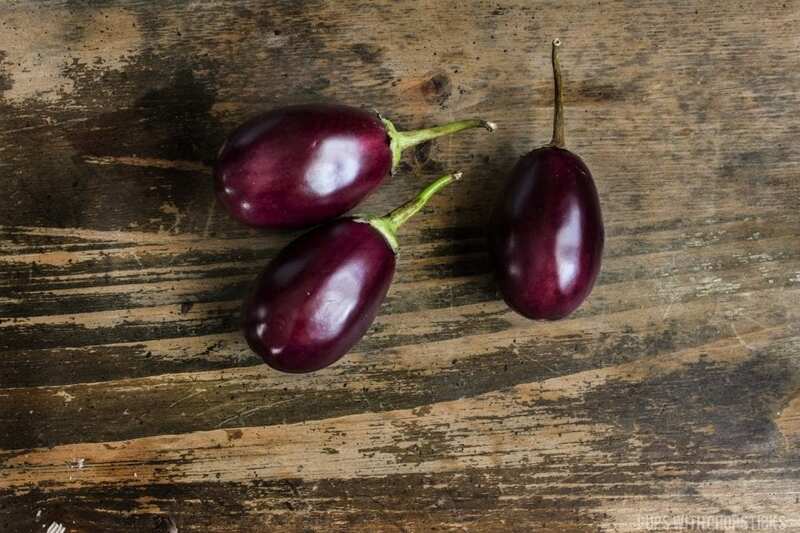 Indian eggplants are a purplish-burgundy, cute little egg shaped fruit that is most commonly used in indian cooking and is usually stuffed or curried. Indian eggplants are usually used in stuffed or used in curries. A popular Indian dish that uses this is Bharta, which is a spicy vegetarian mashed eggplant dish made with roasted eggplant. Like the Chinese Eggplant, I found you didn’t need to salt these eggplant as well since they don’t have a strong bitter taste to it. 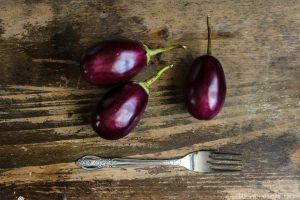 Personally, I use this eggplant interchangeably with the Chinese eggplant when I’m feeling like using minified eggplants – and if I can find them. You can almost always find them at Asian or Indian supermarkets. They look like little eggs! 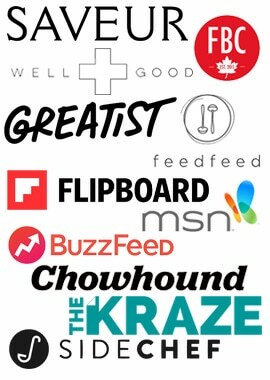 I put a fork in the picture below to give you a rough idea of the size. When you are picking them out at the grocery store, find firm ones with no brown blemishes or dents. The eggplant should have a smooth skin and be wrinkle free and a rich purplish burgundy colour. Indian eggplant, like the Chinese eggplant has a slightly sweet flavour to it but it also has a bit of a light tang as well. Because of the tiny size and shape of the eggplant, it contains a bit more seeds than other eggplants.